Results from this poll reveal strong public support for protecting federal investments that benefit children. In a battery of survey questions identifying a series of potential cuts that Congress may consider in the broader budget debate, the survey finds that voters are more likely to hold harmless programs affecting kids than any other programs on the chopping block. 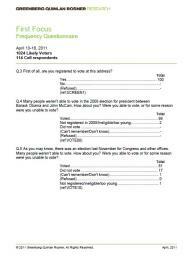 The telephone survey, completed during the period of April 13-18, 2011, was commissioned by First Focus and conducted by Greenberg Quinlan Rosner Research, using a national probability sample of 1,023 likely 2012 voters. In order to better reflect the changing lifestyle of the voting population, the survey also includes a sample of 114 cell phone interviews. The survey’s margin of error is +/- 3.10 points at 95 percent confidence interval.